The above image gives you a good feel for what we’re talking about here. After strapping on the Gear VR Innovator’s Edition and whizzing through a few startup screens, I’m whisked away to some weird wooden cabin place. A quick glance outside the window to my left and it seems I have a nice getaway home on top of Everest or something. Inside the house is basically a giant advertisement for Netflix. Above what I’m going to guess is a 110-inch projection screen, there’s a Bojack Horseman painting, to my right, movies posters for Netflix’s Daredevil, and even on the coffee table in front of me, there’s a vacation magazine for the Rayburn’s Hotel and a pamphlet for Camp Firewood, cutesy references to Netflix’s own Bloodline and Wet Hot American Summer: First Day of Camp original series. After that, it’s basically just the Netflix that you know and love and it all works amazingly well, even the screen hues projected on the floor, furniture, and walls felt incredibly natural. The only small hiccup is that the layout itself—the thing projected on the fake 110-inch screen—feels not 100 percent optimized for vision control. For example, if you glance at a show on the very far right, the description pops up on the left. But you can’t read it because you have to keep your gaze on that title. It’s a really small thing, and probably something that will be ironed out over time, but little small quirks like that pop up here and there. Overall, it was pretty amazing and showcased the scary possibility of never wanting to leave this fake reality—ever. 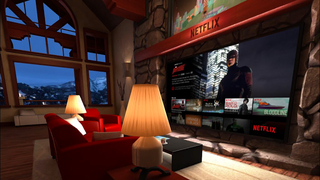 If you already had a Netflix-binging problem, virtual reality just became the ultimate enabler.